I started this blog mainly as an "easy" solution to having a website. Reserved the domain name and set up something really (really) simple so that I could put a website on my business cards. Somewhere people could go and see some images of cakes I've done and email me if they wished. Since that time, my life has taken some dramatic turns. The end of a 14 year marriage, for one.... and all that goes along with that when you have two kids under the age of 11. I don't care who you are or what the circumstances, divorce is harder than you ever think it's going to be. So basically, it comes down to this for me. My kids are the most important things in my life. They are 11 and 7 years old. I have precious little time with them before they are grown up and living their own separate and wonderful lives. Decisions I make with regard to my life directly affect my kids' lives. I want to be an example to them that I can be proud of. I want them to have a mom who enjoys life, takes risks, succeeds, fails, and picks herself up after each disappointment. I want them to see me doing what I love so that they, in turn, will do the same with their lives. It's been great fun creating cakes and cookies and other confections for people. I love it... I absolutely love it.... I did not find this passion until my youngest was about a year old, but nevertheless I found it. But now I have to approach the "fun" more strategically. If I am to be the example to my kids that I want to be... if I am to live my life doing what I love... I need a plan. Not just any cookie... a very specific cookie. One that, when I make it (which has typically been at family gatherings... often out of town).... several guests at the party always want to know how they can order some. Until recently, this wasn't even anything I ever sold.... it was just a yummy recipe I came across and tweaked a bit to make it more to my liking. It's just one cookie... it seems so simple and so trite... yet it doesn't. I hope you'll take this journey with me as I take the steps to turn my part time passion into a full time business... colored along the way with festive cakes and cookies... trials, successes, failures and adventure. Disrupted at times, by life... and kids... and unexpected surprises. So here it is... at least one of the first drafts.... 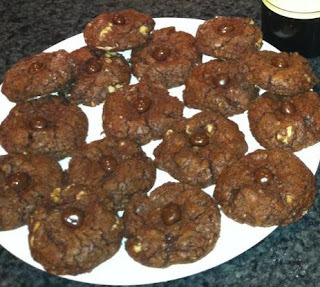 It is a super rich, crazy decadent chocolate cookie. It is made with three different kinds of high quality chocolate. Its flavor is enhanced with espresso coffee and toasted walnuts. The "surprise" finishing touch is a single chocolate covered espresso bean on top. At first I was unsure of the espresso bean, but now I can't imagine the cookie without it. The surprising crunch and burst of texture and flavor really knock it out of the park. This cookie is definitely a "grown up" cookie... Even if your kids like them (my daughter loves them!)... you won't want to share... It also pairs perfectly with a really nice Cabernet. Caymus has proved to be a particularly excellent pairing. And if you're not a wine drinker, a cup of coffee is a fabulous partner to this cookie as well. I can't wait to try one! Love to see you following your passion, Elaine.